You may not be familiar with the term spinal disc injury. That is probably because an injury of this type is often referred to by other names, such as a pinched nerve or a slipped disc. Disc injuries can cause low back pain, sciatica and even weakness or numbness if a nerve is being compressed. 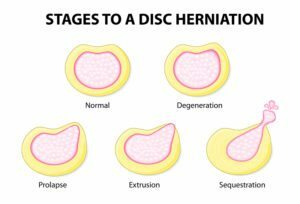 Disc bulging or herniation can occur suddenly due to a single injury or accident. But it is more likely to occur gradually, with one final ‘straw’ producing pain and symptoms. HOW DO YOU TREAT A DISC INJURY? 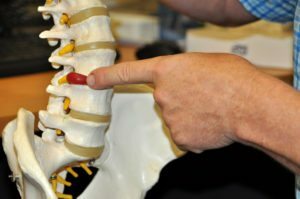 At Coolum Family Chiropractic, our qualified chiropractors will perform a thorough examination including functional, neurological and orthopedic testing to establish if you have a disc injury. If indicated an X-ray, a CT scan or an MRI will be performed to accurately assess what damage there is to your discs. It is important to understand that often it is impossible diagnose a bulging or herniated disc by spinal examination alone. If you think you may be suffering from a disc injury, or any other cause of back pain, it is important to properly diagnose the actual cause. This will ensure that you will receive the correct treatment for your problem and allow the best possible recovery. Give us a call today.